STEVE BANNON HAS tried to distance himself from the ongoing Cambridge Analytica (CA) controversy. 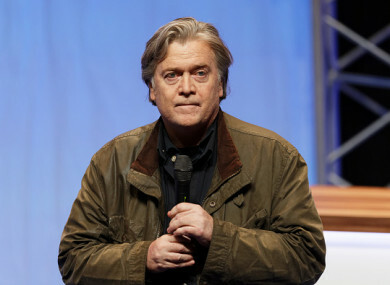 Bannon is a former vice-president and board member of the political consultancy firm, best known for its involvement in Donald Trump’s US presidential election campaign, which has been at the centre of a data mining controversy in recent days. The Guardian reports that, speaking at a conference in New York, Bannon said neither he nor CA had anything to do with “dirty tricks” in the use of information harvested from Facebook. “Facebook data is for sale all over the world,” Bannon stated, later adding that he “did not remember” being part of any scheme to buy data that came from Facebook for use in election propaganda. Bannon served as Trump’s chief strategist for the first seven months of his presidency, but relations between the two men have since soured. In a book by journalist Michael Wolff, Fire and Fury: Inside the Trump White House, which was published in January, Bannon is quoted as describing a meeting between Trump’s son Don Jr and a Russian lawyer during the 2016 presidential election campaign as “treasonous” and “unpatriotic”. Email “Steve Bannon tries to distance himself from Cambridge Analytica”. Feedback on “Steve Bannon tries to distance himself from Cambridge Analytica”.